We’re entering the third phase of touchscreen evolution. In this phase, touch screen hardware is dominated by projected capacitive touch sensors. The introduction of first touchscreen-enabled devices or what we can call the first, or primitive phase goes back in 1965. Far ahead of their time, those capacitive technology devices found some applications but remained niche products for almost 50 years. Resistive touch panels technology tackled some of the most serious disadvantages of those, but still only a few commercial applications were adopted. And then, something radical happened which triggered the second phase and one of the biggest revolutions in the high-tech industry. The impact of this new phase in the industry was tremendous. The revenues of some companies sky-rocketed –namely Apple, while other once-leading companies were led to oblivion (Nokia, Blackberry). The maturing of the involved technologies played, of course, a catalytic role to make this happen, but the spark that lit the dynamite barrel was that the user interface of touchscreen devices became super simple and intuitive. The change in the touch screen hardware paved the way for vast touchscreen adoption. We’re only at the beginning of the touchscreen evolution. The third phase, which is about to begin, will define the new leaders. In phase three, touchscreens will be the most common language of human-computer interaction, replacing keys, buttons, and clicks. We will witness the rise of an immense number of new verticals. Use-cases will range from education to aviation, from vending machines to gaming, interactive desks, restaurants, hotels and our homes and our cars. Good news is the market will grow. Yet this will come along with bigger competition and a strong impact on profit margins. So, touch screen hardware companies must provide high performance, optimized touch sensors. The new applications will bring new challenges, and the number of the constraints design engineers will need to address is going to explode: thinner, lighter, larger, better-performing in harsh environments, flexible screens, moisture-resistant, lower resistivity and material availability to name a few. Even more challenges come with the demand for supporting more touches and different “inputs” (gloves, smaller point styluses, etc). Touch screen hardware engineers must optimize their designs for all the above. On the other hand, cost and time-to-market set substantial limitations to what and when can be done. In such a competitive environment, differentiation and quick decision making will be crucial to product success. At the end of the day, the recipe to keep or even increase profit margins will be the optimization – finding the right balance between quality, cost and speed. Since the touchscreen module is one of the most prominent and expensive parts in touchscreen devices it becomes apparent why optimizing its design is critical. In an industry where the cost of goods may reach the whopping figure of 85% of end price and the shipments are in the volume of millions, saving cents per dollar can make a huge difference in the company’s cash flow. Manufacturers have three weapons in their constant battle for product design optimization. Possibly, defining the design parameters without the help of a specialized software is the simplest and in many cases the fastest method. Hand-calculations can become really handy when estimations are sufficient. They come in different forms such as in-house calculators or just spreadsheets. Therefore, it is quite easy to include hand-calculations in product development flow. The issue with hand calculations is that they are widely based on generalizations and thus can provide just close approximations – no actual optimization. As a result, when product quality or product cost is top priority, one should not rely on this method. Building and testing physical prototypes is the classic way of verifying and validating a product. When utilized properly, physical prototyping can deliver the highest degree of product quality; therefore, it is usually a no-brainer to use it as part of product development. However, prototypes are expensive and too time-consuming to build and test. The cost may easily add up to tens of thousands of dollars in material and labor for each prototype. Also, it’s often quite difficult to reproduce the actual environment the product will operate. If several iterations are required, it can seriously affect the product launch dates. Digital prototyping is in simple words the process of testing the behavior of a product on a computer with the aid of simulation software. It’s one of the basic aspects of computer-aided engineering (CAE) which is becoming more and more popular in the recent years. Through simulation, engineers can test the product before being produced in a wide range of different environments and use cases without the cost of actually constructing such environments. They can examine hundreds or even thousands of different scenarios and come up with a design that meets the given specs in an optimal way. Yet, simulation software today is quite complicated to use. High expertise in physics or even worse in numerical methods is many times necessary to use it efficiently. Finally, for complex designs -which tend to be the norm today- simulation software may become too slow and approach prototyping time. The graph above summarizes the pros and cons of each method. We can readily see that there’s no clear winner. Hand-calculations is a good choice when time-to-market is the single most important priority but other than that it can’t be considered as a suggested option. 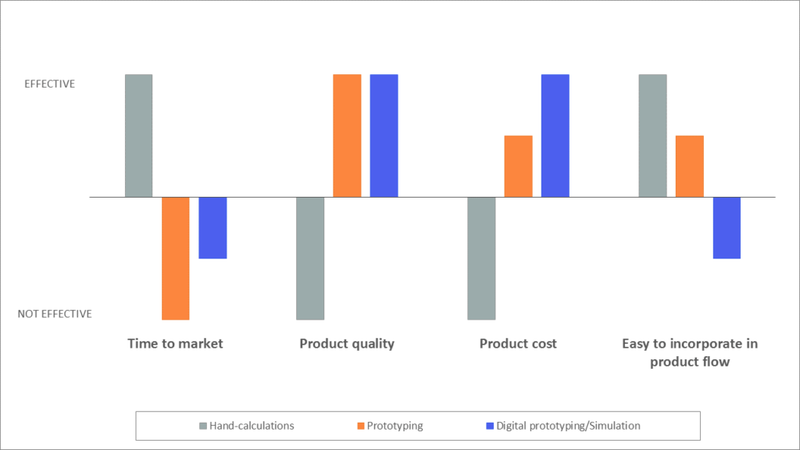 Physical Prototyping offers a clear advantage over hand-calculations on product quality, but it has a negative impact on time-to-market and also affects cost when multiple iterations are necessary. Digital prototyping can offer the best product quality and cost which are critical for phase three. Yet, the difficulty to incorporate it into the product flow becomes a serious roadblock. Touch screen hardware testing has traditionally been done with prototyping, because of the complexity of digital prototyping. What the industry needs is the digital prototyping to become super simple and intuitive to use. This will revolutionize product development. It will help companies to benefit from simulation to the full extend and secure a sustainable growth in the exciting new era. CEO & Co-founder Yiorgos holds an MSc and a Ph.D. in Electrical and Computer Engineering both from the Aristotle University of Greece. He is the principal inventor of one patent; has published over 20 papers and 4 books. Yiorgos has worked in various positions and developed several software tools as a Freelancer. As the CEO, he sets the vision and the long-term targets of Fieldscale. He supervises all operations and he is responsible for keeping the engine moving inside and outside of the company.